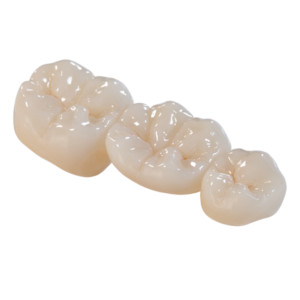 Zirconia full contour is a great choice for the posterior region. It is the strongest material available and it also looks very esthetic for the posterior region. Our zirconia full contour are cad cam designed and milled in house. From this point, we sinter them overnight to achieve the strength that is needed then we will stain and glaze the product. Great option for grinders but we would always recommend a night guard as well for more protection.